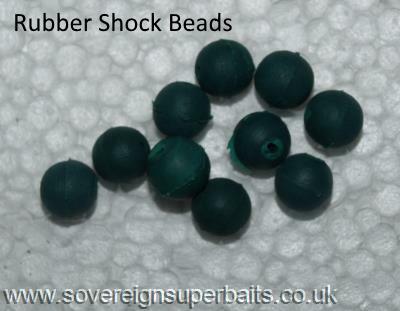 : These are standard 8mm rig beads in the most popular colours used in the UK for rig making. Ideal for attracting flatfish. : These are 7mm rubber/silicon shock beads, packed in tens. They have a multitude of uses, they are not just for protecting knots on running lead rigs. lure anglers use them on top of the rig, above the swivel to stop said swivel going through the top eye in the dark & damaging your guides/rings liners.